If colors could speak, then red would do the talking in Azerbaijan. 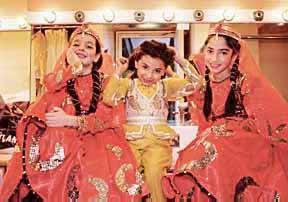 Red is a symbol for happiness, passion, festivity and life. Even the name of Azerbaijan reminds you of red because it means "Land of Fire." Imagine brilliant red flames dancing out of the ground and never dying out. This has been happening in Azerbaijan for hundreds of years in places where natural gas escapes through crevices deep inside the earth and seeps up to the surface. It is impossible to put these fires out. So, even the land of Azerbaijan is red! When a young person dies, a broken mirror is placed beside the grave and a red ribbon is tied around it to symbolize the joy and happiness that was never experienced. Archeologists have found traces of red dye in pottery that is more than 5,000 years old. About 2,500 years ago, the ancient Greek writer Herodotus noted that people used a substance from trees in the forests of the Caucasus for dying their clothes red. Today, Azerbaijanis still weave red into their carpets. It's one of their favorite colors for decorating their homes. People believe red protects them. Red is one of the three main colors found in Azerbaijan's new flag. Red means freedom, but signifies blood since people often have to die in their fight for freedom. The other two colors of the flag are green and blue. Blue is associated with ancient Turks who believed that God was the blue sky. Green refers to the religion of Islam. Azerbaijanis like to give red flowers-especially red roses and red carnations. They often bring flowers visiting friends. Count the flowers. They always bring an odd number-like five or seven. They won't bring a dozen roses, so common in Europe or America. This is because an even number of flowers is associated with death. Azerbaijanis traditionally place an even number of flowers, like two or four, on a grave to symbolize being closely linked in spirit with the person who has died. At Noruz, the Festival of Spring (March 20 or 21), wheat seedlings are grown on a plate and a ribbon is tied around them. 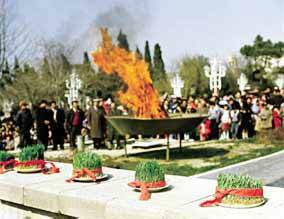 The grandest celebration of the year in Azerbaijan is called Noruz (pronounced NO-ruz), meaning "New Year." It comes on the first day of spring, March 20 or 21, depending on the year. About two weeks earlier, Azerbaijanis start to grow wheat on a plate. They watch over it carefully and water the seeds everyday. When the wheat starts to grow, it looks like grass. Then, they usually tie it with a red ribbon to make it look festive. 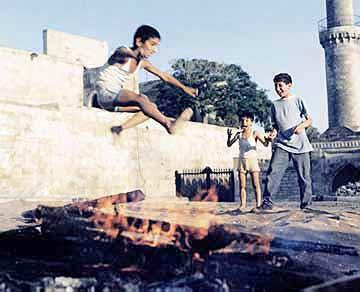 At Noruz (March 20 or 21) children, especially boys, like to jump over bonfires. Also, on the last Wednesday before Noruz, boys build bonfires in the streets and then run and jump over them. They have to be careful not to stumble and fall into the fire, or they could get burned. They make a wish for all the bad and evil things that happened during the past year to go away, so that they can start the new year fresh and clean. People sometimes say in English that someone is "red in the face" or "red-faced." That means they are embarrassed or blushing. In Azerbaijan, the expression is very different. A person who is "red" is someone who will tell you the absolute truth, even to the point of hurting you with their words. But this is considered very rude in Azerbaijan. People don't like to offend others. Red is used at weddings, too. In the past, the bride used to wear a red wedding gown. Sometimes brides in villages still wear red. 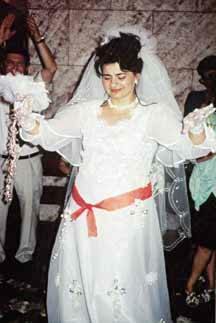 In Baku, the bride wears a white dress with a beautiful red silk sash tied around her waist. Sometimes the groom wears a red tie. Red signifies a new life together. Red is used on Wedding dresses. A red sash is tied around the bride's waist. Red also plays an important role at funerals. Red ribbons and red baubles decorate many graves these days. Red means a young person has died who never had the chance to get married. It's as if the family wants the young person to "see the red" and happiness that he or she missed out on. 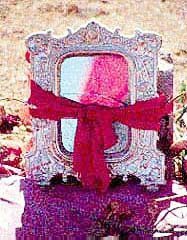 Sometimes at the grave site, a red ribbon will be wrapped around a broken mirror. There are many graves these days covered with red, because many young men have died in the Nagorno-Karabakh conflict. Jala Garibova, Gulchohra Aliyeva and Jean Patterson contributed to this article. Jala and Gulchohra live in Baku. Jean lives in Los Angeles.